Pax was trained by Laurie Kellogg at Bedford Hills Women's Correctional Facility. The fact that Pax came into Bill Campbell's life made his life once again possible. Close lives near the New York state prison, and volunteered there with a writing rehabilitation program. Bedford Hills is also home to the nonprofit Puppies Behind Bars, in which inmates raise and train service dogs. 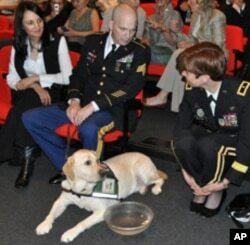 One of its programs is called Dog Tags, specifically to assist wounded veterans from Iraq and Afghanistan. Glenn Close says when she learned that Sgt. Bill Campbell - the first veteran to receive a Dog Tag dog - was returning to the prison to meet the inmate who trained Pax, she had to capture that moment. There wasn't time to hire a film crew so she and her assistant, filmmaker Sarah Harvey, grabbed their personal video cameras and headed to the prison. "We just were there and we just did it. We had basically no huge plan," says the actress. "But then it became so affecting and really important as far as recognizing a wounded veteran like Bill Campbell and the dog that really has saved him and the inmate that trained the dog. And what programs like this do for the inmates, it was something that we said 'you know, let's make it into a documentary." That meeting between Sgt. Campbell and Pax's trainer, Laurie Kellogg, is the climax of the film. "He [Pax] gave me back pieces of myself that I forgot even existed," says Kellogg. "And when he left me and they told me he was going to you, Bill, I sat on my floor and cried. And I realized that by giving me Pax and taking him from me, they had given me the greatest gift anybody had ever given me in my life. That he restored my soul." After the documentary's premiere in Washington, Bill Campbell's wife, Domenica, said that Pax helps her husband in multiple ways - including when Sgt. Campbell struggles with the hyper-vigilance that is one of the symptoms of post-traumatic stress disorder. "We'll go into a restaurant for instance and previously it was, 'Where can I sit with my back to a wall? Where is my clearest vantage point?'" says Campbell. "Now when we go in it's, 'Which table has the least crumbs under it? Where is going to be a good place for Pax to be?' So that's been a really helpful thing." But helping wounded veterans with PTSD or brain injury is not the only thing the Puppies Behind Bars program has done.The film shows how training the dogs has transformed the prison inmates as well. Puppies Behind Bars founder and director Gloria Gilbert Stoga says that she had no idea how many inmates, guards and officials were touched by the wars in Iraq and Afghanistan. "There's a sense in the whole prison community [that] everybody, via these dogs, is doing something for the war effort," says Stoga. "There's a buoyancy in prison now, it sounds like an oxymoron, but there's a buoyancy in prison now because a lot of people have a stake in helping our war wounded." Dr. Joan Esnyara, president and founder of the Psychiatric Service Dog Society in Arlington, Virginia, says the bond between service dogs and their handlers makes the animals uniquely qualified to deal with PTSD symptoms, including dissociative episodes, or flashbacks. "Dogs that are very bonded to their handlers can witness when, if you are looking into someone's eyes and 'the lights go out' metaphorically speaking. The dogs pick up on that," she says. "They know that their owner has just dissociated and a lot of them will just spontaneously nudge their owners to try to kind of get them back to consciousness." Brig. Gen. Loree Sutton is the director of the Defense Centers for Psychological Health and Traumatic Brain Injury. She notes that, while soldiers like Bill Campbell and others wage war, healers like Pax and those working with wounded veterans provide hope. 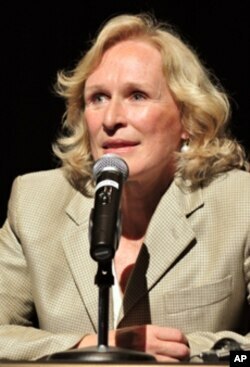 Actress Glenn Close hopes "Pax" will change the public's image of mental illness, including PTSD. "And the hope that Pax has given to you Bill and now all of us becomes the bridge, the bridge to be able to connect," says Sutton. "Perhaps if we had a Pax, we could refocus on what is really important: the relationship, the love, being kinder than necessary. For every one of is fighting some sort of battle." Mental health is a very personal issue for Glenn Close. Her sister and her nephew struggle with different mental disorders. The actress says she hopes "Pax" can change the public's image of mental illness, including PTSD. And she hopes her celebrity and advocacy will help the thousands struggling with mental disorders realize they are not alone.